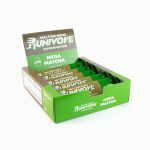 Many people ask us what’s the best way to consume Runivore Vegan Pea Protein. The most popular ways are to add them to your green shakes or smoothies. You can also add a scoop or two to your morning oatmeal to give it a protein boost. 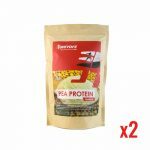 Today, I want to share with you a recipe which is probably the most delicious – while still healthy – way to eat our Pea Protein. Preheat the oven to 350 degrees F or 170 degrees Celsius. Mush the bananas in a bowl. Add oats, protein powder and peanut butter into the bowl and mix until everything is nicely mixed together. Spoon the cookie dough onto a baking tray (a batch this size should make about 12 cookies). Take out of the oven and cool for about 5 minutes. These cookies will last just fine for 3-4 days in a sealed container and several weeks if wrapped and frozen.